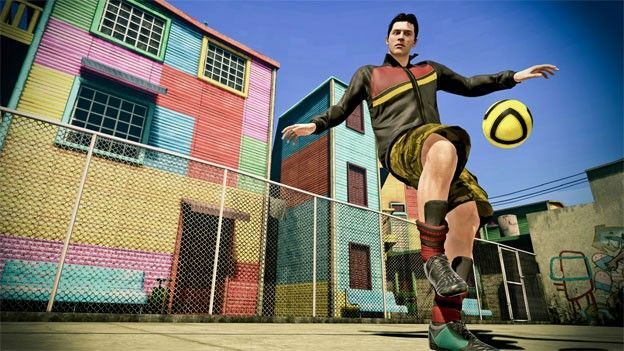 Expanding its dominant array of sporting titles EA Sports has officially revived its street based football sim with the new FIFA Street release on sale now in the UK. On sale from today, March 16th, the latest instalment to the FIFA Street franchise sees football taken to its urban foundations with the showpiece football offering taken on a global tour giving gamers the chance to transfer their well-honed football-based console credentials to a selection of intimate globe-trotting urban environments. Confirmed at GamesCon last year, FIFA Street enables gamers to tackle a variety of pitch types from the childhood memory inducing concrete playground to extravagant show piece stages set in global landmarks such as London's Piccadilly Circus, Tokyo and Amsterdam. "Street football is all about flare, so we'll have the likes of heel passes and flare passing. What we're debating over right now is how difficult to make a pass,” said EA's Creative Director of FIFA Street ahead of the game's launch. "Obviously, in the main FIFA series the difficulty isn't in placing a single pass; it's in stringing 15 or 20 passes together to create space so you can get a good shot away. With such small pitches in Street, one successful pass can potentially put you through on goal for a scoring opportunity." Which EA football title is the one for you, FIFA 12 or FIFA Street? Or are you more of a PES fan? Let us know via the T3 Twitter and Facebook feeds.